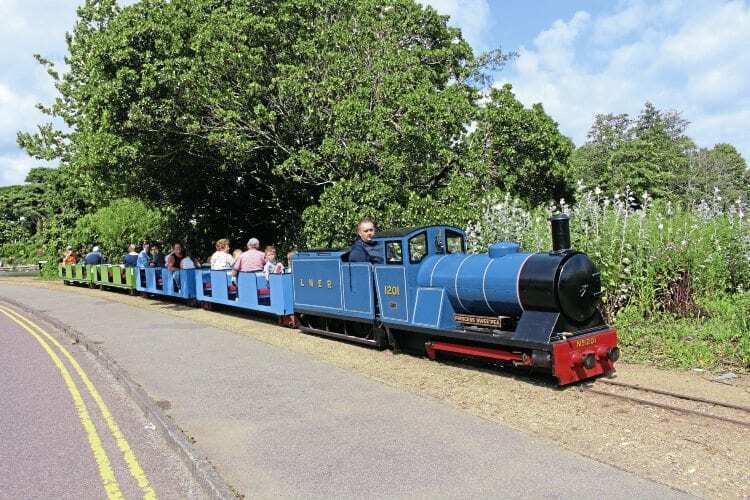 THE 10¼in-gauge Poole Park Railway reopened on July 22 under new management, the Friends of Poole Park (FPP). Professional advice and assistance has been provided to the FPP by Dan Radcliffe of RVM, Hastings. The line is in regular operation, daily when possible, for which more volunteers are required. RVM has also supplied a loco on long-term loan – No. 1201 Princess Swee’Pea – and refurbished the carriage bogies, which were in urgent need of attention. The loco started life as Swee’Pea (Alan Keef 31), a steam-outline 0-6-0DH. It was new to Hastings Miniature Railway (HMR) in 1990 and was the sole loco in use for 20 years, receiving only basic maintenance. from the original loco is the now-unpowered 0-6-0 chassis and dummy smokebox. A second loco – Hasty – a steam-outline Bo-BoPH (RVM 2012) was delivered to Poole in late-July on loan from Hatfield House Miniature Railway, Hertfordshire.